I hope you’re sitting down, because I’ve got some super exciting news to share with you in this week’s edition of Five Minute Friday. Read slowly, I don’t want you to miss a thing! This week I’m thrilled to share this FMF Intro video interview with the lovely Holly Barrett. Check out this FMF Intro video with @asheritah and @HollySBarrett! It has been a sheer joy to get to know Holly a bit better these past few weeks, as we’ve worked together plotting and praying about a possible FMF Retreat. She has been a tremendous help to me, and I’m so grateful for her willingness to serve in this way! Holly blogs at hollybarrett.org, where she hosts a weekly link-up called Testimony Tuesday — be sure to click over to check it out, and join her next week! I know Holly mentions in her interview that she couldn’t share details about the FMF Retreat yet, but guess what?! The first EVER Five Minute Friday Retreat is happening August 7th-9th just outside Nashville, Tennessee! More details will be revealed in coming weeks, but in the meantime, save the dates!! And go ahead and subscribe to this blog in the sidebar on the right, follow the Five Minute Friday page on Facebook, or follow me on Twitter @k8motaung so you don’t miss any info! If you’re new to Five Minute Friday, everything you need to know about it can be found right over here. It’s been happening for years now. Week after week, writers gather brave. We huddle up and bait our hooks. We string sentences and fling the lines far and fast into the vast ocean called the internet. It started with one bold step of faith back in January 2011 — a question, really: What can you write in five minutes flat? And through the faithful labor of its founder, Five Minute Friday has been sustained. The lamp continues to burn. We’ve laughed together and cried together. Prayed for one another and rejoiced over shared news. So far, it’s all been through the glorious connecter called the internet. Avatars will become faces colored by the sun, and there will be voices. Loud, laughing voices and quiet, reflective voices. We’re gathering because this is more than just a weekly writing exercise. This has become an expanding circle of friendship and admiration, of encouragement and hope. At long last, it’s finally happening. We’re going to gather beyond the screen. 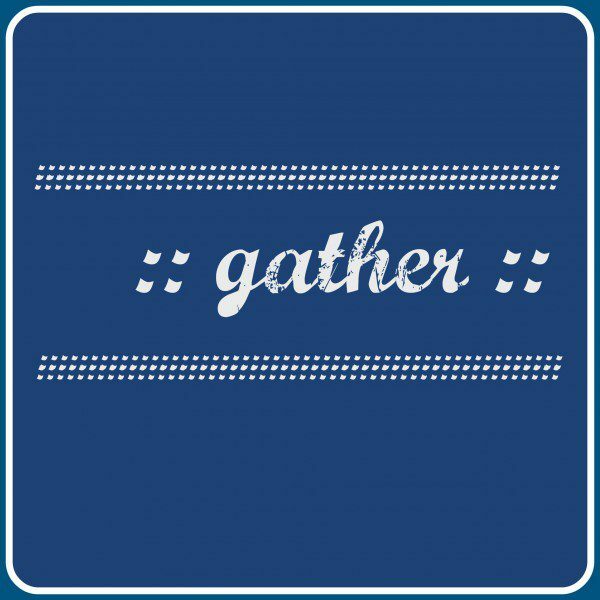 Share your own five minutes on the prompt GATHER by clicking the inLinkz button below. You know what? Even though it’s unlikely that I’ll be able to go (unless God blesses us in a big way financially, which He could totally do), I’m still excited for this. There’s just something so special about this community of people. There’s such realness and openness and genuine love. How amazing that will be in person! I love Holly’s interview! How awesome-she’s a pro! As for the retreat-well you know how I feel about that too! 🙂 I agree that this community gathers because we have this bond and circle of friendship and it is so much fun! Thanks Kate for keeping the lamp burning. You are too kind, Mary!!! Can’t wait to retreat with you and Kate and all the other gals too! Thank you, Mary, for being such a faithful participant and encourager! Kate (and Holly! )–how exciting to know there truly is a retreat in the works! I don’t know if I’ll be able to make it, but iIm praying about it, for sure. It’s fun (and brave) to gather with people you’ve only “met” online. I’m loving getting to know people here at FMF. We’re loving getting to know you, Jeanne! Would love to see you on one of the upcoming FMF Intro videos! 😉 Would be so great if you could join us at the retreat as well! Good gravy you lead well Kate! I LOVE the video intros and wow, a real life retreat. Dang. I love everything about this. Except the fact that I don’t know if I could make it. But I LOVE knowing this is happening. Just so much wow. I just love the way Kate’s taken this community and run with it. So very excited for the videos, the retreat, and so many wonderful things still in store! Oh Lisa-Jo, you always know just what to say. I’m still in shock that you entrusted me with your baby .. but so, so grateful. It has been nothing but a joy and an honor to keep the FMF community alive and well, after all of your labor and inspiration in birthing this fabulous group. You’re the best. So. Excited! I’ve got the dates marked – here’s hoping everything comes together. I believe if the Lord wills me to be there, I will be there. Thank you for your faithfulness to this community! Whoo hooo!!! Joining your prayer for God to work out all the details for you Liz! Yay! Yes, we’re praying that the Lord’s will shall prevail for all who are considering coming along. Really hope it works out for you, Liz! Honestly, I’m hesitant, because my words are one thing…but in person, I’m not like this. I’m the almost silent Chinaman in wraparound Oakleys and a black t-shirt, who’s suddenly THERE and then not. My wife says I scare people. That used to be my job, and I was good at it. I don’t want to scare y’all. Good to see you here again! Though I regret that I failed to mention in my announcement that this particular retreat is going to be reserved for ladies only. Hope you understand. We so appreciate your presence here within the FMF community! Grateful for your contributions, and pray that you’ll keep joining us in the weekly link-ups as you’re able! This is so exciting. I doubt I’ll be able to go, but am hoping and praying you can webcast so I can at least feel like I’m taking part. So fun! We’re excited too, Barbie! Sorry to hear it doesn’t sound like a likely possibility, Barbie! Maybe another time?? Aww, you are too kind, Betsy! All by the grace of God. 🙂 And would love to have you join us!! But yes, I can imagine college tuition changes things quite a bit! Thank you for your encouragement. And btw, LOVE Beth Stiff!!! Thank you, Beth! And maybe one day you’ll set a timer and join us? 🙂 Grateful for your encouragement as a reader and commenter. 🙂 Blessings to you! Oh yes… this: “We’re gathering because this is more than just a weekly writing exercise. This has become an expanding circle of friendship and admiration, of encouragement and hope. And I can’t wait.” I am praying and hope to make it but even if I am unable to attend (this year… you see what I did there?) – I will be rejoicing with all of you who are gathered face to face! Well, not Murfreesboro but it might be close enough for you to combine both trips! We’d love to have you Nannette! That would be lovely, Nannette! The retreat is in Mount Juliet — Google Maps tells me it’s about 40 minutes from Murfreesboro. So, maybe it could work?? Hope so! I am so thrilled by the prospect of meeting this amazing community face to face. So many have become like sisters to me and it’s just a God-inspired idea to put us in the same place. I mean, can you just imagine the fun!! Praying fast that God paves the way! Thanks Kate and Holly for the leg work! We’ll pray the same for you, Tiffany!! We are thrilled, too, Tiffany! Really hope you’ll be able to make it! So excited. This group of women have blessed me beyond words! This is indeed an expanding circle of friendship. Such a blessing to hear that from you, Tara! Oh MY! I’m so excited about the retreat! Middle TN is definitely do-able for me and August is definitely do-able! I have been so blessed by many of these ladies (and some gents) it would be wonderful to face to face! Fantastic! Thrilled to hear that, Christine! Good luck with the retreat! Sorry to hear it’s for girls only. I’ve “met” a number of you through the weekly exercise and truly value your words … five minutes at a time. Linking up with 5 Minute Friday. Left a link on Friday but haven’t had any visitors. We all flew in to gather in her hospital room, in two’s and threes.Population growing exponentially when the nurses and dotors would come in to see her. We didn’t know that before 24 hours was up that we would be gathering all together around her bedside. Hand in hand with those next to us and hand in hand with hers. REalizing then that would be the last time we would gather together with her. Then comes the limbo time. Back to reality but not fully in.Rejoined with children and spouse, awaitng the final gathering . Together, as we are on the receiving end of those gathered around us. Their sorrow, their condolences. Gathering one last time with her present in body but not in soul. Together we will grieve. Alone , though thoughts run rampant. The ‘what’ if’s”plaguing my mind.